Cardiac muscle is one of the three types of muscle found in the human body. It is found exclusively in the heart, where it forms the main component of its middle layer, the myocardium. [Myo]=combining form for "muscle"; [-card-]=heart; and [-ium]=layer or membrane. The myocardium is the muscle layer of the heart. 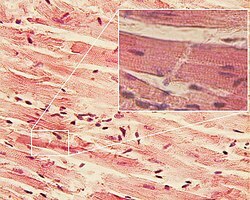 Cardiac muscle has distinct striations and intercalated discs (see accompanying image). The cardiac muscle acts as a functional syncytium. The key characteristic of cardiac muscle is its capacity to contract rhythmically in the absence of an external electrical stimulus. The other two types of muscle (smooth and skeletal) lack this characteristic, called automatism or automaticity. Original image by S. Girod and A. Becker, courtesy of Wikipedia. Click on the image for a larger version.